Bridal Spectacular features a Las Vegas wedding captured by KMH Photography. It was a wedding 10 years in the making when Alison and Ben became husband and wife with a picturesque destination wedding right here in Las Vegas. The couple planned their special day all the way from Texas and their wedding went off without a hitch! Thank you both, along with KMH Photography, for letting Bridal Spectacular share your beautiful Las Vegas wedding with our readers. 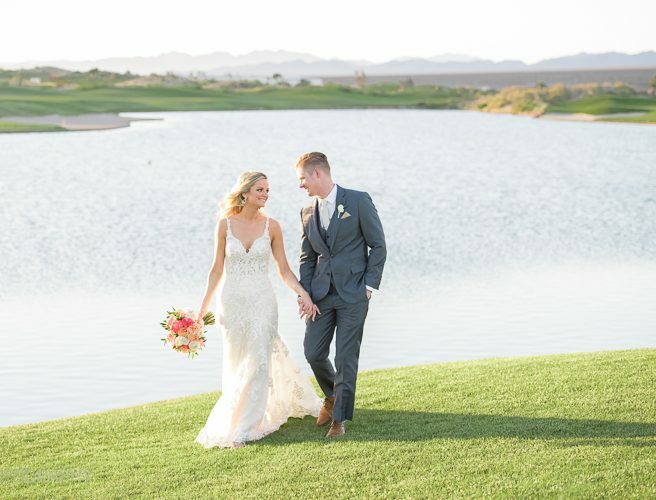 As featured in the fall edition of Spectacular Bride Magazine, Alison and Ben’s August wedding took place at the breathtaking Las Vegas Paiute Golf Resort with a scenic ceremony overlooking the golf course’s glistening lake. Their guests were mostly close family and friends so they could have a more intimate feel. And, although the couple is from Texas, it was easy for them to plan a Las Vegas destination wedding thanks to all of their great vendors! We hope you enjoy this glimpse of Alison and Ben’s stunning Las Vegas destination wedding as captured by KMH Photography! Wedding Hair & Makeup: Amelia C & Co.
To view more real Las Vegas weddings, please click here. For more wedding planning tips and inspiration, please visit Bridal Spectacular online at bridalspectacular.com or follow us on Facebook, Twitter and Pinterest. Also, be sure to save-the-date for our Winter Bridal Spectacular Show January 26 and 27 at the Rio All-Suite Hotel and Casino!